Blouse by SCHNEIDERS SALZBURG. Feminine chic blouse made to the highest standards! 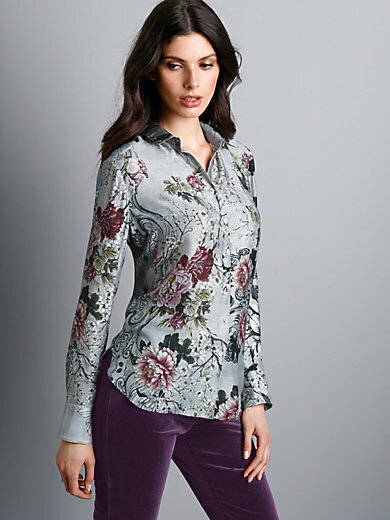 The exclusive SCHNEIDERS SALZBURG print comprising gorgeous floral motifs looks particularly elegant on the exquisite woven fabric with a fine silk shimmer and makes each blouse unique. Trims on collar reverse and button front and a minimal pattern facing on the inside of the cuffs and collar reverse complete the exclusive look. 80% viscose, 20% silk. Length approx. 27ins. The blouse is machine washable.